Reading 20th Century Boys kindles an unexpected reaction within me: rage. This is not legitimate rage, like you would feel if you were reading something so bad that its existence was an insult, but a kind of rage that comes about when you really enjoy something but then it does one small thing that really, really winds you up. Maybe this is how parents feel when their child does something monumentally dumb, like using cake as make-up. It's probably better that I explain the reasons I like 20th Century Boys first, because I do enjoy the series. Much like Urasawa's other works published in the West the series is a first-rate thriller that is unrelenting in its tension. Everything that appears on the page feels it was put there for a damn good reason and each individual element has had painstaking thought put into its creation and use in the story. The characters are every bit as complex and fallible as real people — they can be selfish, ignorant or just plain scared in a way that you can easily relate to and which seamlessly draws you into the world of the story. The plot itself is about a group of kids who grow up in the late 1960s and go through all the usual school stuff — cultural events, bullies, making a secret clubhouse, and creating an ominous club symbol. It is also, at the same time, about the same kids who have grown up to become rather disappointing adults in the late 20th century, a time of much trepidation due to the growing prominence of a cult sporting the very same symbol from the 60s as its logo. The story jumps between these and other epochs at will, bringing a whole new dimension to the story with its use of different concurrent timelines. The art in the series is flat-out wonderful — in the settings, in the characters, and every interaction that occurs there is a visible level of care and attention. Simple things such as one person patting another on the shoulder have a level of detail and thought that makes it a joy to read. 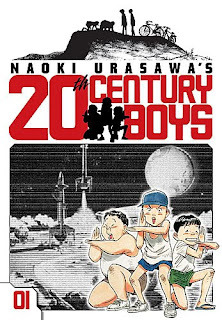 A well known tale is that when Viz licensed 20th Century Boys and Monster together Urasawa requested for Monster, the older work, to be fully released 20th Century Boys was released as the level of development in the art would make Monster appear the poorer series for the direct comparison. While you could easily chalk this up to artistic pretension it turns out to be true — the level of detail lavished on Boys makes the already well-drawn Monster look almost sterile with its comparative lack of finesse. Most of all, it has to be the Urasawa's use of light and shadow that captures the imagination — using the two to lay out a scene, to depict characters, to hide or illuminate elements in the scene and to help draw the eye across the page and manage the flow of the story. All this works marvelously, and kept me gleefully glued to the page while reading. The storyline rewards frequent re-reading — each new volume brings its own new answers that help place previous things into a proper context. This can also work the other way around — you can unwittingly read an important answer and hold on to it for volumes before finally finding the question and all becomes clear. You feel like an active participant in the mystery, where instead of just sitting back and waiting for the ending you are rewarded for looking for answers yourself. For me, and also for others I have talked to about this series, there is a make-or-break point in this manga that comes quite early in its extensive 24-volume run. In volume 5, the plot prepares for a huge event that includes almost all of the principal members of the cast that you have met thus far. The tension is running high, and things feel suitably apocalyptic. Something you have been teased about and which has been hinted at for the balance of the manga so far has come to take its place on center stage. Something massive is about to be revealed, and at this point I would honestly have been satisfied with the reveal no matter what it turned out to be. The time felt right, you are holding onto the comic for dear life, you turn the page and then … nothing. At this point, instead of revealing anything, the storyline undergoes a massive jump, moving to a fresh new setting and then proceeding to set up new mysteries and new characters as if the series was starting afresh. While some readers may like this switch, I certainly did not. I read the remainder of the fifth and the newest sixth volume with a feeling of deflation — the previous tension and awe with which I held the plot had leaked out of me. I can fully understand the thinking behind keeping the details hidden — showing only hints or after-effects of the monster at work is much more effective than just pulling out a plastic model with fake gore dripping off of it, after all. Sadly, I now feel that unless a similar climactic situation is built up that the reveal that would have been will not have the same impact. This also makes me question the structure of the plotline — does this “non-reveal” forecast a similar pattern for other events and revelations to come in the series? Despite my doubts, I fully intend to continue reading the series to find out what happens, and given the way the series plays with timelines, what happened. The stellar quality of the title as a whole means I would be doing myself a disservice if I were not to continue reading, and I would be doing you readers a disservice by not endorsing it as an enthralling work of fiction with wonderful characters. Important note: While this holds true for a lot of series, do not read 20th Century Boys wikipedia page if you are at all interested in the series. I used it for some quick fact-checking for this review and as a result have now been spoilt in regards to some major plot elements. This review is based on a set of Viz Signature graphic novels purchased by the reviewer.